Frank Ocean's blonded Radio returned to Beats 1 on Tuesday for a special episode coinciding with the midterm elections. The show, which is hosted by Ocean and Vegyn, aired in three separate installations: a morning show, an evening, and now, a "third luxury bonus episode," for fans to stream as the results come in. During the show, Ocean called his Aunt Rosie to get her opinion on Trump. "I think Trump is truly in office to make money and that's it," she said. "When he talked about draining the swamp, I think we were the swamp he was talking about ― the American people." He also briefly discussed how music and politics coincide in different ways. 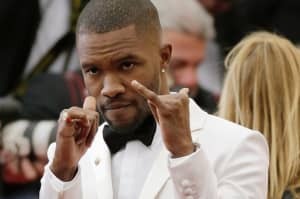 In reference to himself, Ocean said that there's "something overtly political about a queer black man working in music." He also shouted out female rappers, namely, Cardi B, stating that her "being as aggressive as her male counterparts" is a political statement in itself. Ocean also acknowledged his influence on this generation. "I think its a shared choral sound, the voice of this generation," he said. "It's never lost on me, some of the radical parts of my existence, this moment in pop music and in pop culture." The two hosts closed the show by playing YG's "FDT (feat. Nipsey Hussle)" and sharing sentiments on how Trump's hateful rhetoric has forced people to double-down their efforts in combatting racism, misogyny, and bigotry. "I am personally still hopeful that it will bring about change," said Vegyn. "There's momentum from two countering forces." "I wish it didn't take things like this," added Ocean, "But that's human nature ― you need an enemy." Jean Grae & Quelle Chris, "My Contribution To The Scam"
Africa Hitech, "Out In the Streets"
Lou Reed, "Last Great American Whale"
Sharon Jones & The Dap-Kings, "This Land Is Your Land"
Ahmad Jamal, "I Love Music"
The Watts 103rd Street Rhythm Band, "Comment (If Men Are Truly Brothers)" [Remastered Mono Single Version]"
YG, "FDT (feat. Nipsey Hussle)"
Thumbnail photo by Matt Winkelmeyer/Getty Images.